Spa Lovers Dream!!! 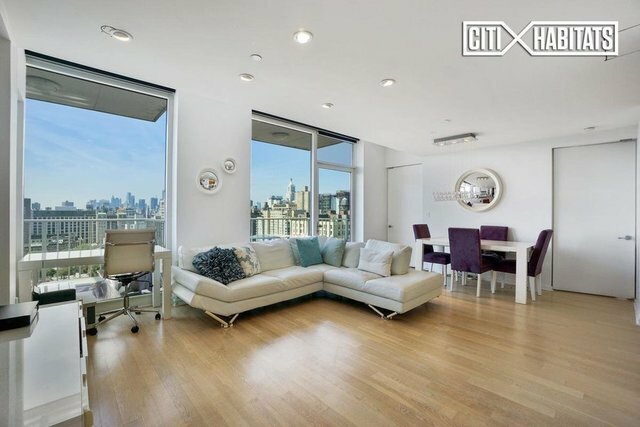 This luxurious two-bedroom, two-bath penthouse condo boasts spectacular views of the Downtown Manhattan skyline from two private balconies. A spacious retreat, the home is complete with high ceilings, floor-to-ceiling windows and light oak hardwood floors throughout. The modern kitchen is outfitted with a Sub-Zero refrigerator, Miele oven and cooktop, and Fisher Paykel drawer dishwasher. There's also a convenient in-unit Bosch washer/dryer. The spa-like master bath has limestone finishes and top-of-the-line Duravit fixtures, and the deep soaking tub looks out over the city through a wall of windows.Located at the prestigious Gramercy Starck, a full-service building with 24-hour doorman & concierge. Resort-like amenities include a 2,600 sq. ft. Starck-designed fitness center with sauna and steam room and a full-floor lounge - featuring a library, screening room and game room. The building's landscaped terrace includes an outdoor marble fireplace, while the lush roof deck features private cabanas for day or nighttime relaxing.